Donald Trump's election and recent wave of executive orders have inspired protests nationwide. 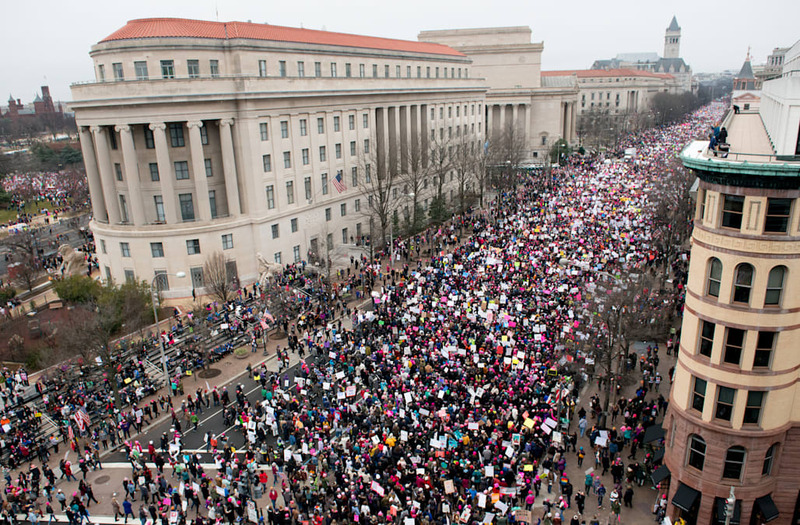 The day after the president's inauguration, the Women's March on Washington swelled to a half million people. Rallies related to immigration, LGBT rights, and other issues have continued to pop up in cities around the country, with more planned in the coming months. On April 22, hundreds of thousands are expected to join the Scientists' March on Washington, while more are expected to protest at the People's Climate March a week later. Activists are also participating in other forms of political action. Over 13,000 women are planning to run for office in 2018, New York magazine recently reported. Donors have given millions of dollars to nonprofits like the ACLU and Planned Parenthood, and consumers are boycotting retailers that do business with Trump's family. The recent wave of action is only the latest in a long history of American activism. Here are 17 photos that chronicle some of that legacy. In 1917, ten suffragists, who called themselves the “silent sentinels,” were arrested when they picketed outside the White House. The women's suffrage movement is considered one of the first modern activist movements. The labor movement, which was also grew in the 19th century, fought for safe working conditions and increased pay and benefits for laborers. The civil rights movement, which began in 1954, aimed to end racial inequality, segregation, and discrimination. At the 1963 March on Washington for Jobs and Freedom, which drew approximately 250,000 people, Dr. Martin Luther King Jr. delivered his famous “I Have a Dream” speech. In one of three marches from Selma to Montgomery, Alabama, protesters joined together in response to the voting obstacles and threats of lynching that African Americans faced in the South. ... which helped spark a mainstream anti-war movement. "The Flower and the Bayonet" by Marc Riboud, 1967. In 1982, around a million people filled New York City’s Central Park to protest nuclear weapons during Ronald Reagan's presidency. The 1969 Stonewall riots catapulted the LGBT rights movement into the mainstream. Activists led three days of protests after the NYPD raided Stonewall Inn, a gay bar in Manhattan’s Greenwich Village neighborhood. Though the environmental movement started in the 19th century, it gained more mainstream appeal in the mid-20th century. The US celebrated its first Earth Day on April 22, 1970. Around the same time, the disability rights movement began. Activists worked to end disability discrimination and institute more accessibility regulations. With the PC boom in the ‘90s, protesters started leveraging the internet as a mobilization tool — though some efforts have been more successful than others. MoveOn.org, founded in 1998, was one of the first online platforms that allowed users to make petitions, fundraise, and organize marches. Today, many activists use Facebook and Twitter to organize around issues. When the HIV/AIDs epidemic hit in the ‘80s and ‘90s, LGBT rights activists urged the federal government to fund research and treatment. The Second National March on Washington for Lesbian and Gay Rights drew around 200,000 people in 1987. The women’s movement, which began with suffrage, has since expanded to address reproductive rights, sexual violence, a lack of educational opportunities, and the wage gap. The March for Women’s Lives took place in Washington DC in 2004. Protests related to immigrant rights grew in the early 2000s. In 2006, hundreds of thousands of people protested against anti-immigration legislation in cities around the US, including Los Angeles and Chicago. In 2016, people started staging sit-ins at Standing Rock, an Indian reservation where the Dakota Access Pipeline is slated to be built. The protests are part of the Native American rights movement, which began in the early 19th century after President Andrew Jackson’s Indian Removal policy. In recent years, many activists have adopted the notion of intersectionality, which acknowledges the intersections of racism, sexism, class, homophobia, and more in the dynamics of power and oppression. The idea was prevalent in the Women’s March on Washington. “Women’s rights are human rights, regardless of a woman’s race, ethnicity, religion, immigration status, sexual identity, gender expression, economic status, age or disability,” its organizers wrote. Activists are still marching to make their voices heard, and many acknowledge that today’s protests are built on the work of past generations.